MedOne is a state-of-the-art multimedia platform, perfect for residents and experienced specialists alike. It currently covers eight subject areas: Medical Education, Communication Science (Audiology), Neurosurgery, Spine Care, Radiology, Plastic Surgery, Otolaryngology, and Ophthalmology. MedOne is designed as the destination for clinical education and reference, essential for users to develop and refine clinical skills. Established practitioners can stay informed of the latest research and master complex procedures, while residents can review essentials, prepare for boards, and strengthen skills. With MedOne, the highest quality medical resources are available to everyone in your practice, anywhere, anytime. 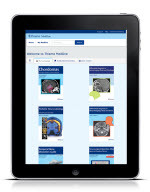 Each platform lets you users expand their knowledge through e-books, e-journals, manuals providing guidance on the latest clinical techniques, surgical procedures, and must-know cases enriched with exquisite illustrations and quality video content. MedOne’s easy-to-use environment makes finding information fast and efficient. Use on or offline, or with the mobile app so users always have access to the information you need. MedOne is designed to advance knowledge. Users can save their most relevant documents, take notes, and even build virtual binders to share with students or colleagues. Content collections, curated by experts in their fields, are available exclusively on MedOne and provide users with master insight on specialized techniques and treatment options. Available to institutions through the internet. Flexible agreements with several licensing options. All licenses automatically receive updated content as new titles are released.